1. Check your Junk/Spam folder. Most web-based email providers have a spam filtering system and sometimes they misidentify registration emails as SPAM so you should always check this folder first. This also applies if you are use an email client such as Thunderbird or Outlook as these programs often have built-in junk mail filters. If your original registration email never arrived then you can get our system to re-send it by trying to sign-in to your unconfirmed account. Please note that sometimes emails can be delayed so make sure that you allow at least half an hour before assuming the worst. All entries are chosen entirely at the discretion of Alchemy Carta Ltd.
* Your website must be efficient and easy to use: it should be quick and easy to locate any Alchemy products through the use of a logical tree structure and/or a search facility. The purchase process should be efficient, simple and fast. * Secure Payment: the website's checkout/payment process should use SSL whenever Credit/Debit payment card information is entered. * Ascetically pleasing: the quality of a website is very important. Emphasis will be placed upon a site's overall standard of design and appearance, and no special preference given to gothic-themed sites over more conventional ones. An unattractive site may be considered to undermine confidence in and reflect poorly upon the Alchemy brand. * Extensive Range: Alchemy must be satisfied that the business represented by the website carries sufficient stock of a substantial and suitable selection of Alchemy Gothic products. * Brand Status: preference will be given to dealers who show sufficient respect to the Alchemy brand and are seen to be enhancing the status and value of Alchemy's products. 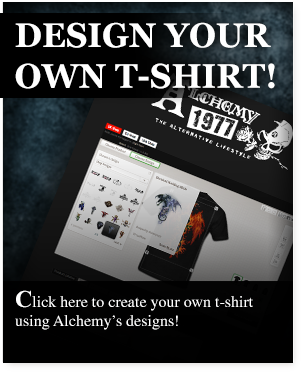 Alchemy products should always be found within a suitably and visibly branded context and not appear on the same site as any bootleg or plagiarised products. 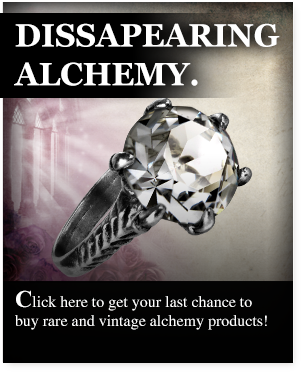 Nor should Alchemy products be displayed alongside discounted items or be promoted in any fashion which might perceivably undermine their value. Entries will only be considered in response to an online request from the dealer. 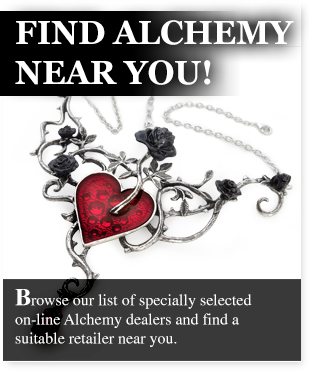 Any basic listing will be free of charge and by submitting an entry for inclusion in the RECOMMENDED ALCHEMY DEALERS list, the above terms are accepted and it is agreed that they may be included entirely at the discretion of the Alchemy Carta Ltd.. Alchemy reserves the right to decline a request and to withdraw any listing at any time without prior notice. It’s a 2 minute form, costs nothing to subscribe and there’s no hassle, no risk. 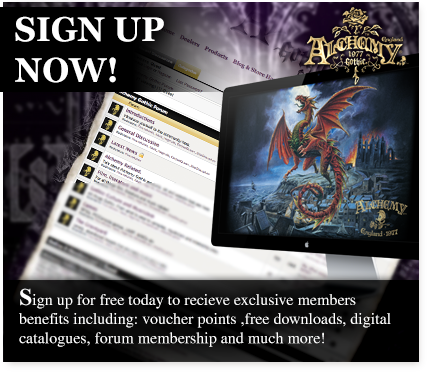 We’ll just drop you an email, (up to four times a year), with advanced news on Alchemy’s latest new products and any Alchemy Gothic related news. Check out the benefits of becoming a member. Download for FREE our 64 page full colour Alchemy Gothic catalogue PDF files. Search and view the entire Alchemy Gothic Art Gallery. As a registered member you will be able to view the complete library. As a non-member you can only view a small selection of our extensive library. Become a member NOW! Earn points as you use the site. Amazing special offers and exclusive products only available to members. Full access to the Alchemy Gothic Almanac and all of its secret history. Pose; submit Photos of You and Your Alchemy and view other members.